Pauline F. Halstead, 81 of Galena, IL passed away Monday, July 16, 2018, at Mercy Medical Center, Dubuque, IA. Funeral service was held at 11 AM Saturday, July 21, 2018, at the Furlong Funeral Chapel, Galena, Illinois. Burial was held in Greenwood Cemetery, Galena. 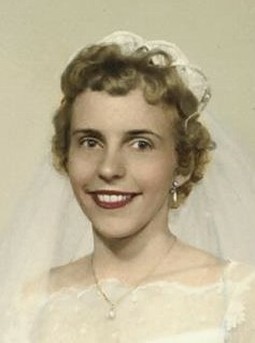 She was born October 26, 1936, in Platteville, WI the daughter of Paul and Florence (Fuller) Olson. She attended Iowa School for the Deaf for some time. Pauline was united in marriage to James F. Halstead on September 29, 1959, in Galena and he preceded her in death on July 14, 1992. She worked for the Galena Laundry and Burgess Battery Factory, Galena prior to her twenty-five years at Eaton Corporation, Hanover, IL. She enjoyed puzzles, delivering papers to her neighbors and video chatting with family and friends. She is survived by her two sons, Kim of East Dubuque, IL and Richard of Galena, two grandchildren, Devin (Amanda Klauer) Halstead and Taylor (Jason) Engle both of Galena, three great-grandchildren, Eli, Cole and Paisley Engle, brother in law, Mel (Pat) Halstead of Hanover. She was preceded in death by her parents, her husband, three brothers, and two sisters. Furlong Funeral Chapel, Galena, IL, handled her funeral arrangements. Thanks to Furlong Funeral Chapel, Galena, IL and Terry Ann Check for the information.